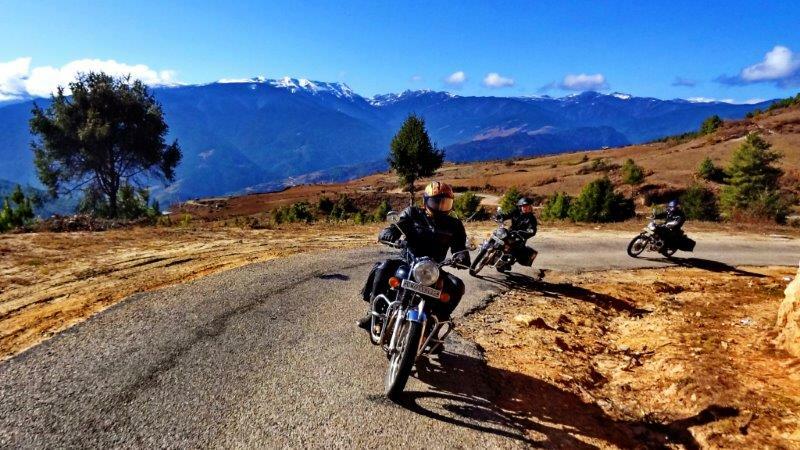 ​Bhutan is truly a heaven for bikers and they are rewarded here with incredible natural beauty, ancient Buddhist culture, magnificent mountains, lush green countryside, pure air and striking architecture. This motorcycle tour program also show an intimate insight into Bhutan’s Buddhist culture, traditions and way of life. The mountainous roads are well maintained reaching height up to 4,000m, offering the most romantic sights of the Himalayan ranges and the rides are also through various types of vegetation ranging from sub-tropical to alpine, in the valleys passing through many village of terraced rice fields and fairly-tale rivers. In fact, this ride has it all, winding mountain roads, off-road trails and scenic stretches through some of the most pristine forests, and is bound to satisfy every rider. After arrival in Paro, you will check into your hotel and have a short brief about the details of the tour. After that, you’ll go for visiting the main attractions of Paro, such as Watch Tower, Rinpung Dzong (the fortress of the heap of jewels), and the ruins of Drukgyal Dzong. Today, you will take your bike and head to Thimphu, the most modern city in Bhutan with an abundance of restaurants, internet cafes, nightclubs, and shopping centers. Thimphu is also the only capital city in the world that does not use traffic lights. Instead, a few major intersections have policemen standing in elaborately decorated booths directing traffic with exaggerated hand motions. Overnight and dinner will be in Thimphu. Today, you will wake up early for visiting the beautiful city of Thimphu. The main attraction includes Buddha Dordenma statue which is one of the largest statues of Buddha in the world, the Takin zoo, and Memorial Chorten which is built in 1974 in the memory of Bhutan's third King, his late Majesty, King Jigme Dorji Wangchuk. The final stop of the day will be in Phobjikha where you’ll spend the rest of the day and overnight. After breakfast, you will take your bike and enjoy a great ride through Phobjikha Valley, a bowl-shaped glacial valley located on the western slopes of the Black Mountains. You’ll end the day in the historical city of Trongsa. Today, you’ll visit the city of Trongsa located on a steep ridge from where you’ll enjoy spectacular views of the deep valleys that surround the city. You’ll have with a lesson of the history of the kingdom at the Watchtower of Trongsa that has been converted into a museum dedicated to the Wangchuck dynasty. Then, you’ll visit Trongsa Dzong, the largest dzong fortress in Bhutan, which is visible from anywhere in the town. You will continue riding until you reach Gelephu. Here, you’ll spend a relaxing night. Bhutan on the border with India. Gelephu is a warm, fertile region with plenty of rainfall. The region is also the gateway to the Royal Manas National Park, the oldest nature preserve in the Kingdom of Bhutan. Its incredible biodiversity includes hundreds of rare animal and plant species that cannot be seen anywhere else in the world such as golden langurs, Gangetic dolphins, and the Asian one-horned rhinoceros. You’ll end this great day in Punakha. After breakfast, you’ll visit two amazing places which are Punakha Dzong, the second oldest and second largest dzong in Bhutan, and Chimi Lhakhang, also known as the temple of fertility. Punakha Dzong is famous for containing the preserved remains of Zhabdrung Ngawang Namgyal, the unifier of Bhutan as well as a sacred relic known as the Ranjung Karsapani. The amazing temple of Chimi Lhakhang stands on a picturesque hilltop between Punakha and Wangdue and was built by the Buddhist saint Lam Drukpa Kuenley popularly known as the 'Divine Madman'. The place is famous for its fertility wish grants to childless couples. You’ll enjoy a pleasant ride till Paro, the final stop of the day. Here, you’ll have dinner and spend the night. In the last day of this amazing journey, you’ll hike to Taktsang monastery, known as the ‘Tiger’s Nest’, one of the most iconic landmark and religious site from Bhutan. It is built around a cave in which Guru Rimpoche meditated. The monastery clings seemingly impossible to a cliff of rock at 914 meters above the valley floor. For the local people, it is a place of pilgrimage, but for a tourist, the monastery is exhausting, thrilling, and mystical. It surely will be an amazing experience. Overnight in Paro. This is the end of the tour. You'll be going back home safe and sound.